This is the sixth blog in a series being written by our fantastic Youth Ambassadors whilst they are in New York where world leaders are going to agree on a set of Global Goals. 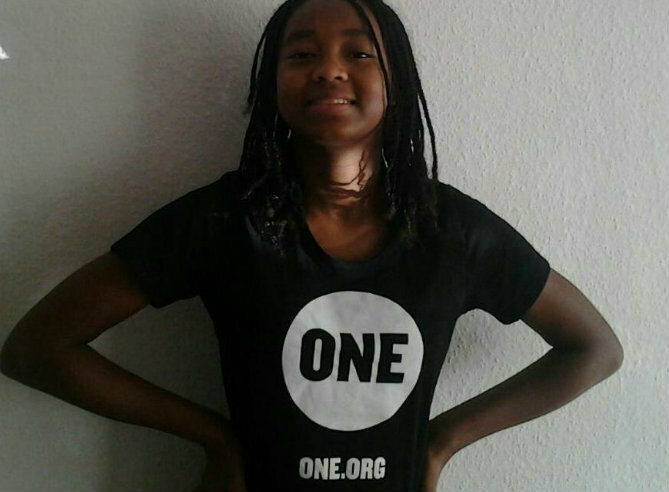 Kassandra Ramey is our Youth Ambassador from Germany and she’s writing about why it’s so important to achieve #GlobalGoal Number 16: Peace, Justice and Strong Institutions. This is my little sister. She is 12 years old and is in 7th grade. She loves hanging around with her friends and like the other teenagers her age she likes being girly. She also gets on my nerves every now and then, but that’s what sisters are for, right? When I told my family I would be going to New York and that I will be there when the Sustainable Development Goals will be announced, they were interested in what I am going to be doing there an they also were interested in why the Global Goals meant so much to me. So, I decided to explain the principle of “Good Governance” to my sister and see if I could get her to understand why it is so important for development and eradicating extreme poverty. The citizens elect the government in democratic elections. Their task is political governance. They try to transform the will of the majority in practical policy. They also represent the country to the outside world and it has the responsibility for the implementation of laws. So then I tackled the question what makes the governance “good”? It needs to have a good control system. This is also called the principal of Constitutionality. This means that the state’s government and administration can only act bound in law. This will prevent despotism of those in power. Furthermore the civil rights must be guaranteed and the civilian should be able to trust the implementation of laws. Every state has a budget. The government must make expenses in the interests of the people. For example when something major in your school is broken, when a road needs to be fixed or when hospitals need more medication. Another major element of good budgeting is making sure that citizens of a country can track how government expenses have been made, and when. This is all about transparency. What does transparency mean? It means that the government has to be like a window when it comes to their expenses. Like you can see through a window, you can see through the government’s expenses and you will know where the taxpayers’ money goes to. The reason this is important? It’s because a government owes it’s citizen Accountability. This means that whenever the government makes a decision, it needs to take the opportunity to talk to the people about that decision and it needs to answer the questions of the people. In order for there to be good governance, people need to understand the decisions of the government. The best way to do this is through encouraging people to get in a dialog with the government, and this creates Participation. Everybody should be able to join the political dialog and everybody should be able to vote. Another important element of good governance is Justice. The government needs to try to be as fair as possible to the citizens. That means that human rights and civil law must be adhered. There need to be the same opportunities for all (for example for men and women). When I went through a rough explanation what “Good Governance” means I finally asked my sister why she would think “Good Governance” could help fight poverty. Furthermore she thinks that human rights should always be followed by the government and that the government has to make sure that the money gets to those in need (she also said that it makes her very sad that there is no help for children in need). And this is the key. When my 12-year-old-sister understands why we need “Good governance” in fighting extreme poverty, you should too. If you believe that good governance should be a priority in driving the Global Goals, add your voice and stand as ONE today!